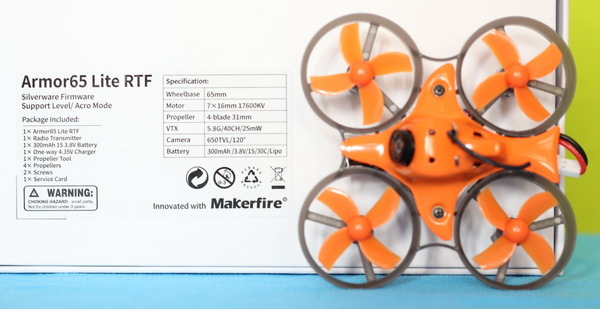 The Makerfire Armor 65 Lite drone is an excellent micro brushed Whoop that’s easily capable of both indoor and outdoor flights. Thanks to the versatile Silverware flight controller, it features Acro and Level flight modes. So, whatever you are, a completely newbie or a more experienced pilot, the FUN is guaranteed! Although it’s on the market for couple of months, I hope my Makerfire Armor 65 Lite review will reveal you new interesting things about it. Let’s start with the variants you have. 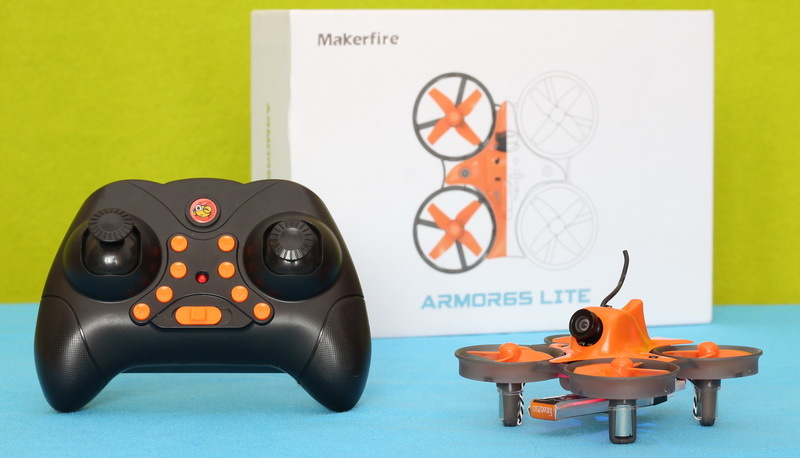 Makerfire offers their Armor 65 Lite drone in RTF and BNF packages, as well as in DIY KIT which needs to be assembled by yourself. For a higher budget you can opt for the Armor 65 Pro, which comes with more versatile F3 flight controller and multiple radio options (FrSky XM, FlySky FS-RX2A, RX800 Pro or DSM2). About 4 minutes flight time. Disclosure: I received this tiny brushless Whoop as part of a product review collaboration with Makerfire. Product specs and quality may vary according to the manufacturer’s reliability, so I cannot guarantee that you will get exactly the same RC drone as seen in my review. Firstly, MakerFire wanted to send the package with DHL, so, as lately I had very poor experience with them, I requested another shipping method. They were very collaborative and in 2 days I got the new tracking number. 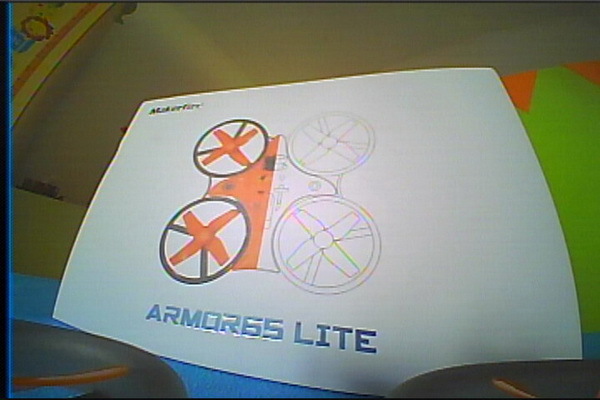 Two weeks later I received the Makerfire Armor 65mm Lite. In addition to the drone and its transmitter, I found inside the box the following: 3.8V/300mAh HV LIPO battery, USB charger, 1 set of spare propellers, blade removing tool, spare stick-ends and some stickers. Like most Tiny Whoop clones, the Armor65 Lite is also build on a uni-body frame. All the electronic parts are well protected by the plastic canopy. Although it has no carbon fiber parts, it feels very sturdy. Measuring just 80 x 80 x 35 mm, it easily fits into my palm. As you can guess from its name, wheelbase (diagonal rotor-to-rotor distance) is around 65mm. Behind the protective canopy there is a single electronic board. The STM32F030 based Makerfire Tiny Lite flight controller has built-in radio receiver and it comes with Silverware firmware. No USB port, just soldering pads, which makes it harder to do any PID tuning or firmware update. The FC has 4 status LED lights (2 x RED in front and 2 x BLUE on back). In order to allow easy and soldering free replacement, all the 0716 type motors are provided with connectors. The tiny 4-blade propellers feels tight on the motor shafts, hope that they will not start to pop-off after few crashes like in case of other Whoops. The 300mAh battery can be recharged using the included bulky USB charger (no case, just PCB). The charger can be switched between 4.2 and 4.35 voltage. Note: never try to charge standard LIPO batteries at higher voltage, it will reduce the battery life or even explode. As I previously mentioned, the “Lite” version comes in bundle with an entry-level remote controller. Frankly, this little bird would have been deserved a better transmitter, not such a toyish one, even if it has two type of stick-ends. Luckily, the RC uses BayangToys protocol and it can be replaced with a better open-source transmitter like the Jumper V2 Plus. According to the product specs, the RC allows about 100 meters control range (of course, only in optimal conditions) which should be fairly enough for indoor practice as well as for proximity park flying. On front panel, besides the usual control sticks and power switch, there are 8 trimming buttons. While the left shoulder button (CH5) allows to unlock/lock motors, the right one (CH6) allows to toggle between Angle and Acro flight modes. 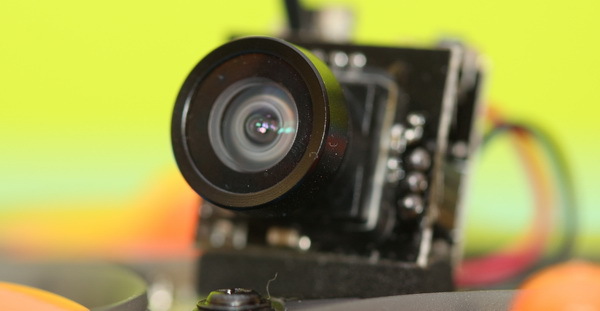 In front of the aircraft is located a tiny (16 x 14 x 12mm) 800TVL AIO FPV camera. The m8 lens provides 150° field of view. Toggling between NTSC and PAL video standards can be done by long pressing the unique control button. Changing channels (1-8) and bands (A, B, E, F and R) can be done through the same button. All changes are confirmed by status LED lights. The integrated 5.8G video transmitter is 25mW rated. Image quality is quite nice for such an inexpensive drone. FPV signal is really strong. No problem to cross two brick walls. Outside, the range is close to 100 meters. Blade protectors are slightly visible in the live video feed. Binding steps are easy, you need first to power ON the drone, than the remote controller. The LEDs on the aircraft will flash till successful bind. On stabilized mode you can’t flip it. The tilting angle is set approximately to 45 degrees. Switching to Acro you can do anything you want or can. You know, on YouTube freestyle flying looks so easy, but you need lots of practicing hours to do that and probably a better remote. I’ve been pleasantly impressed with how much of a beating this little drone can take. Thanks to the large prop guards, you often just bounce off and can continue flying. Even the props didn’t started to pop-off. Unfortunately the motors are not stopped automatically in case you crash it up-side down, so they can burn-out if props are stuck in grass. Also, it does not have turtle mode (auto-flip back). With stock LI-PO battery I got an average of 4 minutes flight time, quite good from such a small drone. Anyway, it’s definitely worth buying a few batteries to keep you in the air for a longer period of time. If you are looking for an entry level FPV drone, the Armor 65Lite can be purchased directly from the manufacturer’s online store. You can pick one up with transmitter (RTF) for $49.99 or without a remote (BNF) for only $42.99. Surely, with 50 bucks in your pocket is very hard to find a better micro class “Tiny Whoop” drone. It comes ready to fly out of the box. Its flight performance will be widely appreciated by beginner and expert pilots alike. Both control and FPV range are around 100 meters. No turtle mode nor OSD. Let’s be fair, the Armor 65 Lite its not unique in its market segment. 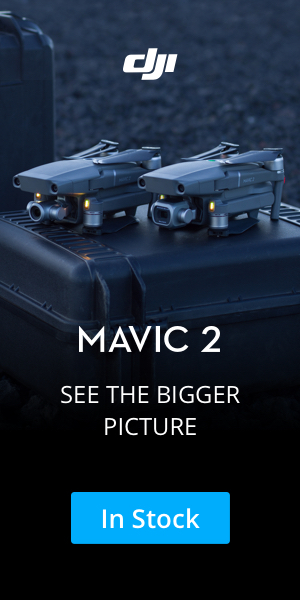 There are a lot of similar micro sized FPV drones with more or less features. As I mentioned in the introduction of my review, even MakerFire offers a more customizable alternative, called Armor 65 Pro. If you like the design but you want something bigger, you can take a look on the Armor 85 Lite. 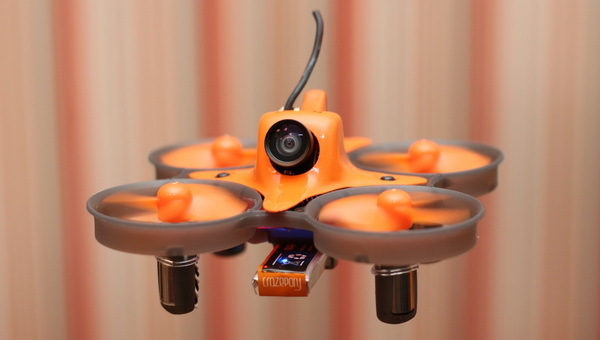 The Eachine M80S is also an excellent option, in addition to the Angle and Acro flight modes, it features altitude-hold mode.